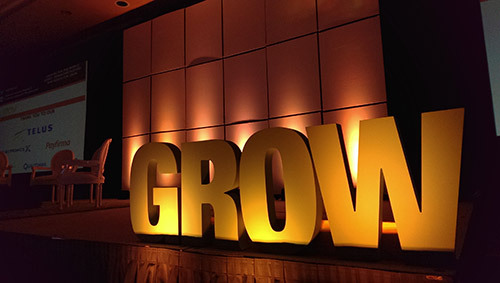 I just attended the Grow Conference here in Whistler and I wanted to share a couple thoughts. Billed as “an experiential playground exploring the future of innovation, growth and entrepreneurship” the conference tagline is LIVING IN A CONNECTED WORLD. These themes are near-and-dear to me so I was thrilled when they announced they were coming to Whistler this year. Offering a Lean pass, I was able to secure a fair priced ticket without the need to pay for transportation etc. The conference, which took place at the Fairmont Chateau Whistler, was well organized and aside from a couple audio and scheduling issues, everything ran smooth. Along side the conference was a two day hack-a-thon. The challenge; To create a “connected” resort town! I wish it preceded the conference so that I could participate in both. The mix between technical and non-technical attendees kept the discussions mostly high-level. The people I tended to connect with were lower-level developer types. With my poor entrepreneurship skills, I was unable to secure millions of dollars in venture capital. I wasn’t actually trying to sell anything. Except maybe Whistler. I would offer local advice, help every lost attendee, and generally just say “how awesome is this place eh?”. I probably wouldn’t have turn down 100k for my idea to start a hackerspace here in Whistler. In fact, I am trying to start a hackerspace right here in Whistler. Sadly, this town isn’t filled with geeks. Only few local tech companies like Guestfolio and Ridebooker here in Whistler and they represent a small percentage of the employers. No reason this can’t increase. Wearables and Internet of Things – These are definitely the hot topics getting all the attention. The Internet of Things (IoT), which everyone mutually agrees is a poor term, seems what you call any connected device that’s not a computer. Wearables, obviously are worn. Think Google Glass, Recon Instruments, fitbit, Nike+, etc. Privacy and Security – These topics always come up immediately afterwards. As soon as you think “Cool, I can open my door from the internet” you realize that theoretically anyone else can too. That sleep monitor, check-in data, and all the things tracking you for convenience can be mined or interpreted and used against you. My opinion is those that take this serious will win out. I was very impressed with SmartThings founder Jeff Hagins opinion on the subject and glad they are staying separate from Samsung after just recently being acquired. I can’t say the same for lax attitude of Life360, whose founder repeatedly made broad statements like “I don’t think your average user cares”. Their product GPS tracks family members btw. Data – Data, Data, everywhere data. It’s not enough to just collect it, you need to use it. Inform. Best talk and what resonated with me most was Scott Jenson’s How to make everything discoverable with the Physical Web. In it, he smartly discussed how the physical web will need a mechanism unlike the current app model. The idea that every future smart-thing would require it’s own smart-app obviously has flaws. Just Google “app fatigue” and you’ll see for the past year or so the world isn’t very appy anymore. Yay web! And that’s the idea, broadcast URI’s, no passive tracking. I’m looking forward to experimenting with this. You can too. Find out more with examples on GitHub. Overall it was a great conference. I hope to be back again next year. Pablo is a physical chatbot. An open source social robot. Pablo got his name from (PyAIML Arduino Bluetooth Low-Energy Object) or something like that. AIML responses are constructed from a set of reduced answers to planned questions. eg. “What’s your name?” “Who are you?” “What are you called?” = PABLO. NOTE: The USB cable in the eye is a temporary 5v power source only. Not quite Natural Language Processing but with random responses and recollection it can make for a convincing conversations. An Arduino with the Adafruit EZ-Link Bluetooth Shield receives the response from the host computer. The response is interpreted then commands issued to eyes, servos, and speech module. I used the proto area of the shield to connect headers to which I can temporarily plug in the text-to-speech module, two servo motors, and the level converter connection to eyes. The eyes are controlled by a small microcontroller from Adafruit called the Trinket and is powered by the lipo battery. They are self supported and can easily be repurposed for other projects. I used a 16 pixel ring and a 12 pixel ring which made some of the eye functions a little specific to this build. The logic level converter is used to receive commands over I2C from the 5v Arduino microcontroller using the Tinywire library. Everything is currently crammed into a cardboard box with a speaker pointed down into the mouth. A talking function randomly moves the jaw servo while Pablo is talking, opening and closing the mouth. This combined with the advanced settings of the Emic2 voice module make for endless hilarity. A second servo twists the head briefly, as one might picture a confused dog, when an answer is not known. The datasheet from Parallax(PDF) shows you how to change the basic settings and take advantage of the more powerful DECTalk processor. Lots of things to build on, still tons to do, least of which is his “personality”. I plan to document more of the details and code as I go because today I’m hoping Pablo can help me win a trip to space! If not, he’s about the size of a CubeSat and I’ll send him into space. 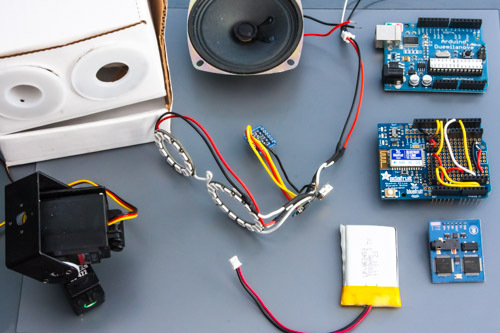 UPDATE: Pablo was honoured to make an appearance on Adafruit’s July 23rd Show and Tell!